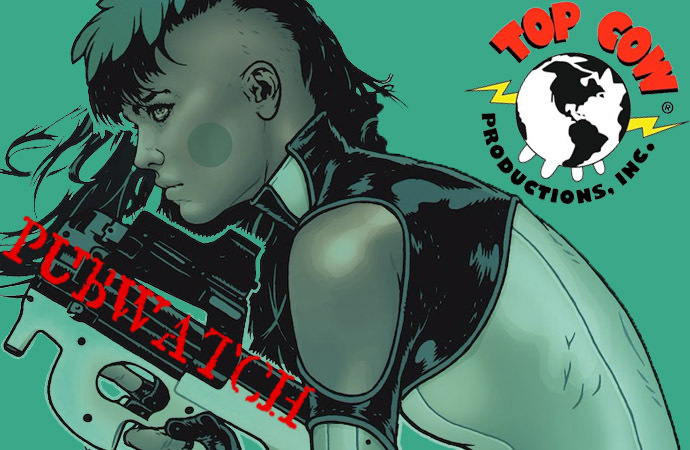 In my first Top Cow Pubwatch, I talked about Eclipse getting picked up for television. 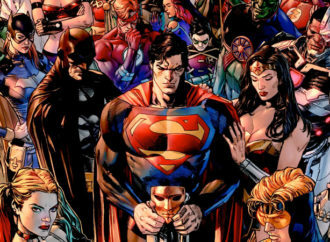 Now, Robert Kirkman’s Skybound Entertainment is grabbing several other Image titles, including Top Cow’s The Darkness and Think Tank, which will be executive produced by Top Cow’s founder, Marc Silvestri, and president, Matt Hawkins. 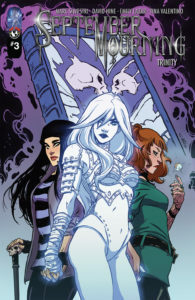 While the show is in the works, 2019 will see the relaunch of The Darkness. Hawkins promises that Jackie Estacado will return, but not as we expect. Witchblade’s Sara Pezzini will also be there, but again, we haven’t heard much else about what the two Artifact wielders will be up to in this new story. 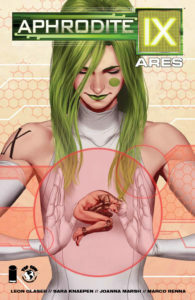 If you need a Darkness fix before that, it will come at the end of the year in the Ares IX one-shot. Meanwhile, September Mourning has got something new for their fans with the release of “Empire,” their latest single, as well as issue #3 of the Trinity storyline. Scroll down for my mini review! It’s been a unique thrill to see my name attached to such a well-loved character! 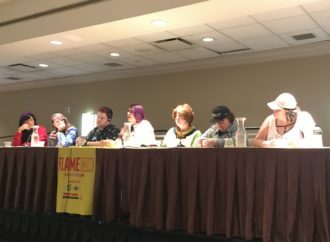 This is a far better opportunity to professionally break into comics than I ever could have hoped for. On that note, I’m also extremely grateful to the Top Cow team for giving me this chance, and for the positive response the book has gotten thus far. Having my name on that credits line is an incredible motivator to keep going and create more stories. 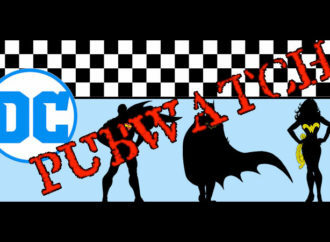 WWAC enjoys a monthly feature called Cover Girl where we analyze a comic book cover featuring one or more women. 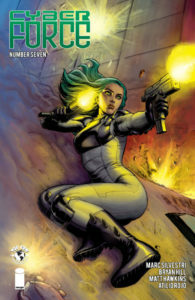 Looking at the covers of some of October’s books, I decided to do a mini Cover Girl feature of my own, just for Top Cow. 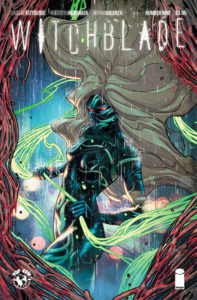 This month features Witchblade #9, Cyber Force #7, and Aphrodite #4. 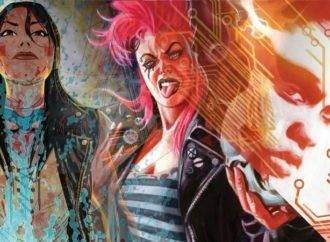 Gone are the buxom bad girl babes of Top Cow’s ’90s, but these women are no less badass and beautiful. All three women are surrounded by violence and movement, whether they are creating it themselves, or responding to it. Despite this, there’s a sense of serenity in the flowing lines of Alex’s swirling mass of hair and the Witchblade’s coils, Aphrodite’s eyes in Cyber Force and the stillness and focused intent that Aphrodite V has always displayed in her new series. Top Cow’s speedy delivery of trade editions of their books makes it easy for readers to play catch up. If you’re new to Top Cow, or looking for a break from the Big Two cape comics, Cyber Force is a refreshing twist on the mutant/alien superhero drama genre. Writers Hawkins and Hill have really waded into the idea of technology taking over our humanity. It permeates a lot of the Top Cow Universe titles—particularly the ones that involve Aphrodite, who gets a new past and future here. 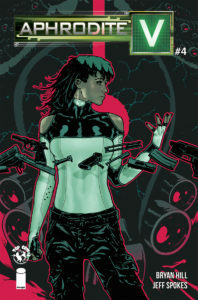 Cyber Force has reawakened in the latest volume of their transhumanism story. Violence has brought Morgan Stryker under the ownership of Cyberdata who, with the permission of Stryker’s daughter, have grafted him with cybernetics. Carin, the aforementioned daughter, has likewise undergone enhancements, but unlike her father, she’s done this because she wanted to. In my review of the first issue, I expressed concerns over the ableism displayed in Carin’s new origin story. The implication is that Carin has been confined to a wheelchair her whole life and, thanks to Cyberdata, is now free, perpetuating the fallacy that disabled people dream only of being whole again, and aren’t whole as they are. 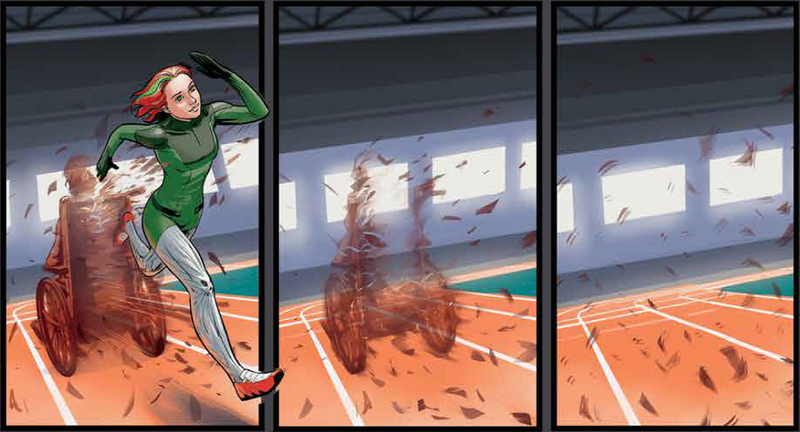 The second issue doubles down on this, with further imagery of Carin busting through her disability with her new speedy legs. Her desire for the “fix” is presumably meant to serve as a counterpoint to the various ways the rest of the team has come to be a part of Cyberdata’s machinations. Velocity has always been a central source of growth to Cyber Force’s story and the motivation of the other characters, so we’ll play wait and see regarding her adaptation to her new legs and abilities. Team Witchblade just keeps getting bigger and bigger, this time adding another returned-from-the-dead person to Alex’s recently returned-from-the-dead life. I guess it’s good to have friends, especially when they are more interesting than the main character. Meanwhile, Maggie, the antagonist from the previous issue, has some troubles to deal with in prison when it turns out the higher-ups aren’t too happy with her failure to deal with Alex and get the Witchblade back. This issue was severely lacking in Witchblade, with only a few moments of Alex in whip-cracking action and no conversations with the Artifact. Though I guess having too much of a good thing would only make me complacent. The Earth Security Agency is under scrutiny after the incident in El Granada where a hostile alien killed many humans before being killed itself. The alien Consortium has business dealings with the ESA, but all of that may be compromised by a more direct threat to aliens and humans alike. Agents Rice and McIntyre are at the centre of both the controversy and the chaos, but Rice might not be handling the situation too well. There are a whole lot of questions being asked of the ESA, but it seems the ESA can offer very few answers, largely due to ignorance or incompetence. Questions questions questions. That is the chilling focus of this volume, as the WNN journalist calmly asks the questions the rest of Earth is demanding answers to. What is the Port of Earth? Why is it here? What do we know about it? Who are the Consortium? What are their plans for Earth? October is a good time to launch a creepy space mystery. When almost all of humanity is lost due to the Heat Death of the Universe, there’s, understandably, going to be some stress among the survivors left on the Orpheus. The story focuses on security officer Deva Karrell, who, on top of her survivors’ guilt, must now deal with the space station’s first murder and the ramblings of the man who appears to have caused it. Cady cites influences like Alien and Lovecraft, but, reading this first issue, I can’t shake that absolutely chill-down-my-spine feeling that I got from Event Horizon. So my answer is, honestly, I feel really good. Maybe even great? This project has been a year of hard work coming out of a very dark place and it feels so cathartic to have it out in the world, with so many kind and wonderful people being so supportive. I’m glad people are digging what we’re doing, and I’m even more excited for what they think of issue 2! If you have been reading along with the single issues, you’ll know that Team Stryker has gone in search of a bounty hunter that goes by the name of Ripclaw. 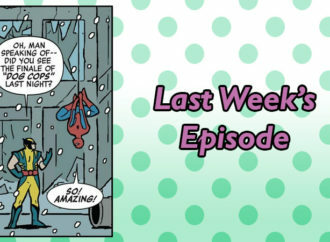 In the last issue, we met him playing grudging hero, and he continues that here. His mission is interrupted by Stryker, who “just wants to talk.” Personally speaking, if I want to talk to someone, I don’t try to blast them off their bike with a giant gun, then get all shocked and offended when they get pissed about this. 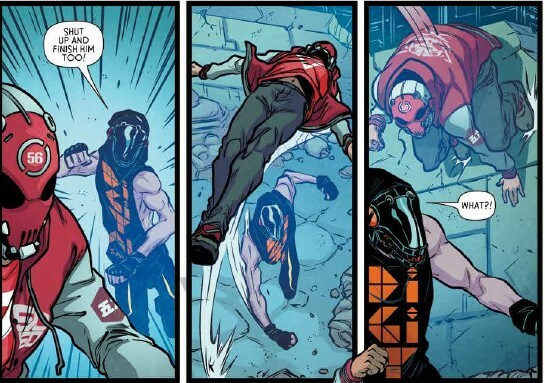 I wasn’t particularly impressed with this pause to pit Ripclaw unnecessarily against Stryker, Aphrodite, and Velocity, but thankfully, those pages didn’t take up the entire book. Soon enough, we get back to questioning humanity, what’s right and wrong, and the rights and ethics surrounding our technological advancements. Double crossing double crosses is the name of the game in this issue as Rose tries to reconcile with and understand her father’s plans for the city. Meanwhile, the Underground still has no interest in the cure, but the Albino and Dr. McHome are intent on seeing their research to its fruition. All the players come together in this issue and, well, something’s gotta give in the next one. This issue is a good time to really appreciate the artwork. A lot of comic artists tend to skimp on the backgrounds, but Timpano gives just as much attention to the expansive cityscapes as he does to each each character. This is a very detailed world, right down to the melted human flesh, and it’s all topped off with Dispenza’s colours. Kudos to Top Cow for giving Dispenza ample backmatter space to talk about his work as a colorist. In the not-so-distant future, parkour gangs vie for control of the city and a neurological drug threatens the streets. 56 is a mysterious newcomer whose “bonehead” mask and nanotech give him skills that leave the other boneheads of the city in the dust. The art is crisp and colourful and the story… well… let’s just say that I’m probably not the target audience for this story and leave it at that. Basilisk is the creation of Martin Carver’s father and it’s time for Hui-Men and Aphrodite to stop it. Though she doesn’t trust the android, Hui-Men accepts that the living weapon is pointed in the right direction, even when they come face to face with their enemy—which turns out to be a rather anticlimactic event. Important things happen in these final moments of the last issue in this story arc, but the Basilisk plot almost feels like a cursory event when all is said and done. Still, this all does serve to introduce us to a new Aphrodite, and to carve out a place for her with these new companions in this world on the brink of technological chaos. 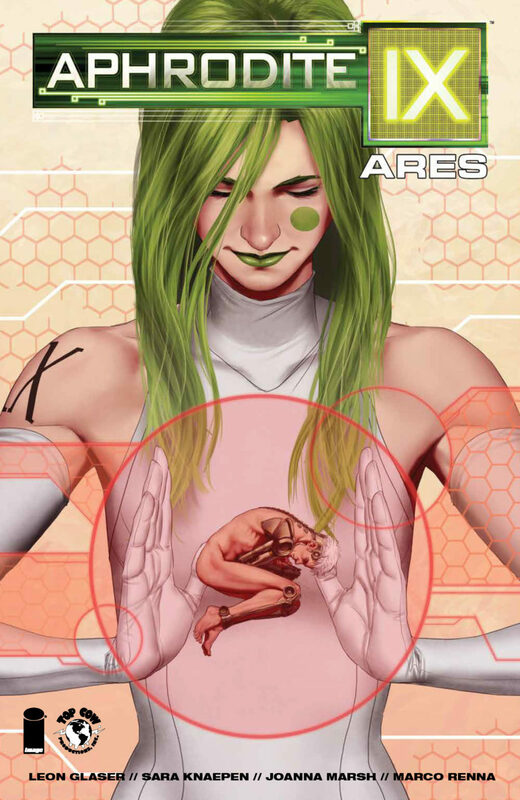 Basilisk’s ties to Carver run deep, and I am sure we have not seen the end, especially considering the roles Aphrodites play when it comes to the pros and cons of transhumanism and technology across the Top Cow Universe. This issue features a variant cover by Raffaele Ienco. It’s cute and all, but I’ve grown pretty partial to Spokes’ renderings and the more lithe, relaxed lines he shapes Aphrodite with. September and Claire make a new friend and now they are three, which is just as the Fates decreed. Once Hannah comes to terms with her new life, the Trinity moves on to the next step in their adventure. Things continue to move quickly, thanks to various tropes and convenient plot elements that give the sense that the story could benefit from a bit more depth, but the dialogue is self-aware enough to make it clear that there’s no point in dwelling. Readers are expected to hop along for the ride and see where Fate next leads our favourite reaper. 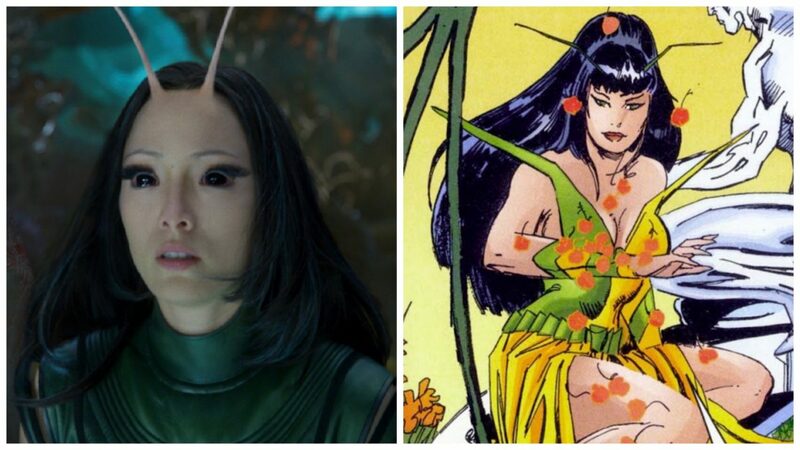 The art is an improvement on the previous volume, with far greater detail paid to September’s appearance, and especially her costume—something that bugged me before, considering the character is based on an exquisitely dressed real live (dead?) person. With all The Darkness news starting off this month’s Pubwatch, I decided that’s a good place to end it too, taking a look at the other media that Jackie Estacado has graced: video games. In 2007, The Darkness was released for PS3 and Xbox 360, as developed by Starbreeze Studios and published by 2K Games. It follows Estacado’s introduction to the entity known as The Darkness and the depraved things it makes him do, including watching the fridging of his girlfriend, Jenny Romano, at the hands of the mob boss that wants to punish Estacado. With the Darkness’ powers fuelled by his rage, Estacado goes on a vengeful rampage. I didn’t play the first game but, despite the fact that the plot functions entirely because of Romano’s murder, I did hear a lot of good things about the particular scene where Estacado gets to share a beautiful moment of cuddles on the couch with Romano. Since I’m the kind of gamer who, thanks to BioWare, is pretty quick to jump in bed with any NPC I can get my hands on, I appreciate that this game didn’t allow an option for such shenanigans, and even rewards players for simply enjoying the moment. 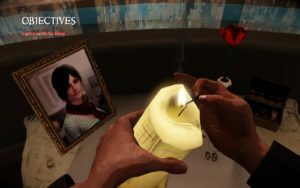 Following through on Estacado’s love for Romano and his desire to rid himself of the Darkness, The Darkness II features lots more violence as Estacado trails ghostly images of Romano, in hopes of saving her from the hell she is apparently trapped in because of his actions. When I played it back in 2012, I was morbidly amused by the various ways Jackie and the Darkness and its minions could murder people (assecutions FTW), and smitten with Estacado’s feelings for Romano. 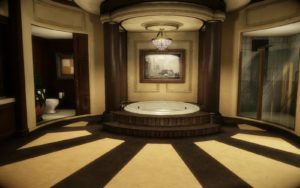 I also spent a lot of time touring Estacado’s mansion with its gorgeous architecture and decor. 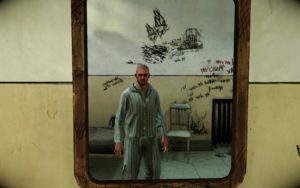 The game certainly had its issues, relying on tropes such as Jenny’s fridging, and the insane asylum stereotypes that plague video games and do nothing to break the stigma surrounding mental illness. But I did appreciate those many quiet, heartbreaking moments between Estacado and Romano, and, six years later, still have a screenshot or two from the game as my desktop wallpaper.